Now, six months after the worst scandal in the history of our supermarkets, the biggest joke of all has emerged. And it is the shops and food manufacturers that are having the last laugh. 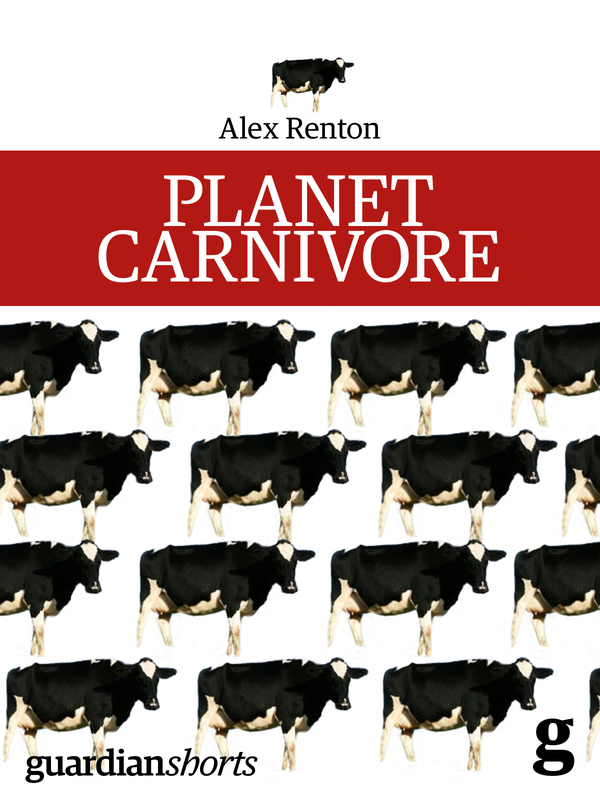 The big stores and food suppliers that, for years, have let horse, donkey, pork and who-knows-what other foreign substances into cheap burgers and ready meals have been told what penalty they will face. The answer is precisely none. No prosecution, no fines, not even any new regulation to prevent them pulling the same revolting stunt again. Tesco vs Sherborne – can the big guy afford to blink? 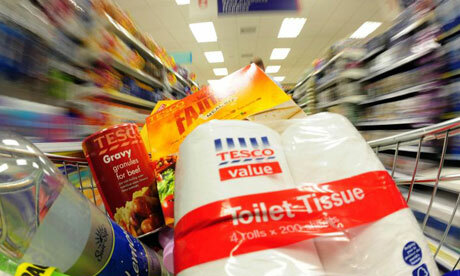 Extended version of my story “Tesco, not in our backyard”, published in the Times 19 March 2013. Comments below. The lady from Tesco is having a horrible day. She’s driven from Bristol – leaving a sick toddler behind – to the little Dorset town of Sherborne where, frankly, almost everybody hates her. Her job is to sell the idea of a new Tesco store to a community that doesn’t want it, at a time when Tesco – according to a recent Which? magazine- is by far the most unpopular supermarket in Britain. And the survey was done was before horseburgergate. They don’t look aggressive, the townsfolk who’ve marched up the famously charming high street to Digby Hall, where Tesco is staging a presentation, “Investing in Sherborne”. There’s a preponderance of tweed and country jacket green; some dreadlocks but more trim hair-dos. 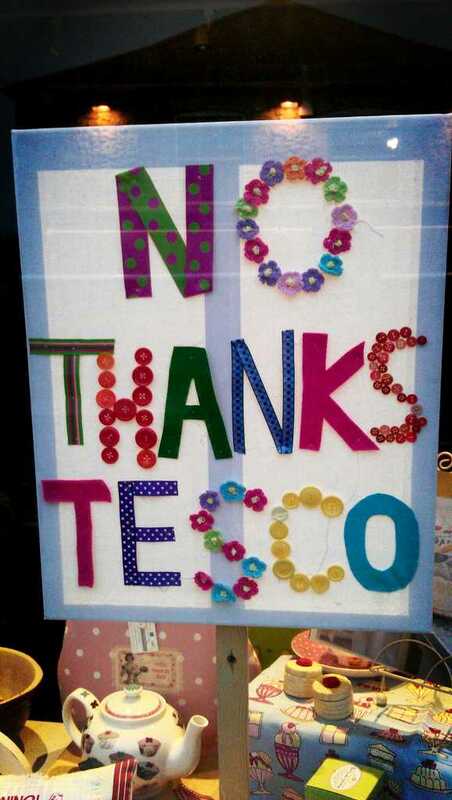 The protest posters are decorous against the honey-coloured stone – there’s a “No Thanks Tesco” made of buttons and embroidery in Tesco colours. The rudest slogan asks the supermarket chain to “burger off”. “It’s just like Les Miserables,” someone laughs – but it is actually a very English affair. There is a TV crew and local celebrities: Valerie Singleton, journalist, once of Blue Peter, and Canon Eric Woods, vicar of Sherborne Abbey. He is impressive in red-buttoned, ankle-length black robes. He says that Tesco is just wrong for a town like Sherborne, and won’t do any good. “You’d be amazed at this stereotype of supermarkets being cheaper. It’s just not true. 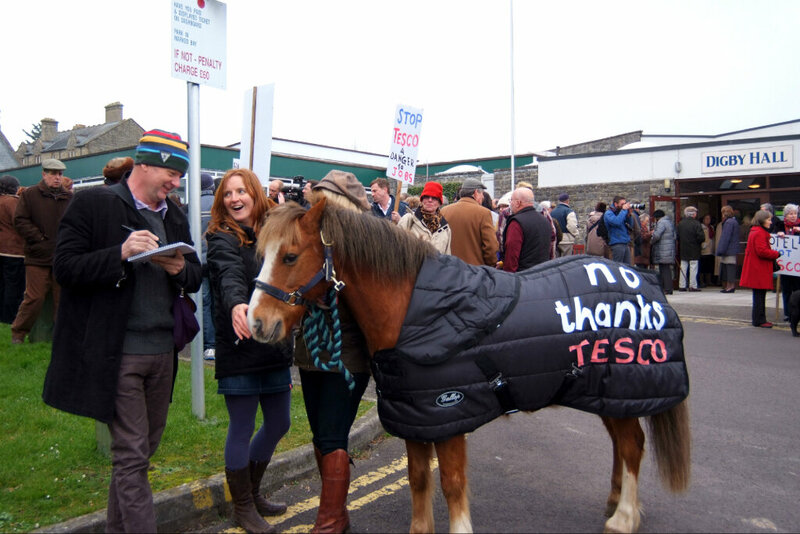 Our local butcher is cheaper: I should know, on a parson’s stipend you have got to be canny.” Most of the attention goes to the anti-Tesco pony, a live one, led by a former BBC journalist. 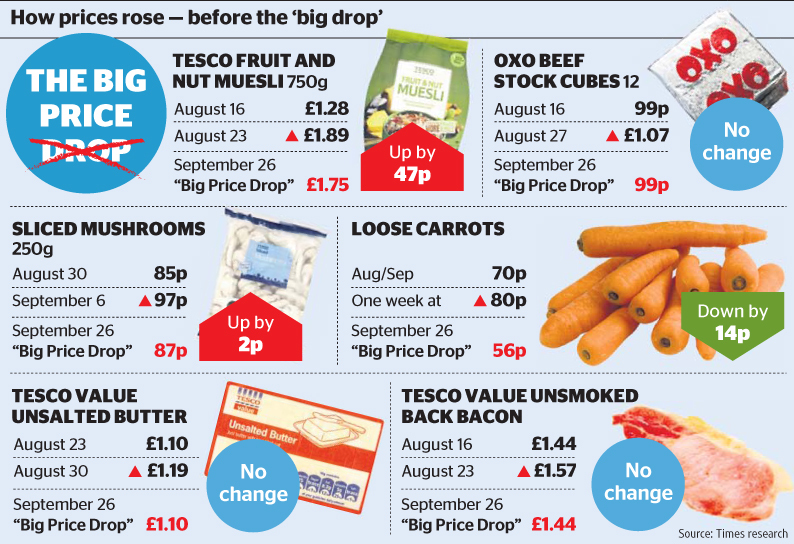 Dozens of the savings offered by Tesco in its “Big Price Drop” — the £500 million campaign that started a supermarket price war three weeks ago — are on foods that were sold only briefly at the higher price, research by The Times has shown. Huge advertising promotions this month have promised discounts on 3,000 items. “Sometimes you have to put aside just the pursuit of profit in order to get back in tune with the nation,” said Tesco chief executive Phil Clarke as Big Price Drop launched. But Tesco appears to have raised the price of hundreds of items in the weeks before the promotion, perhaps to make the subsequent offers look more attractive. Sir Terry Leahy is retiring as head of Tesco after 14 years, “to spend more time with his private investments”, according to yesterday’s Guardian. He got the sort of press that’ll make a nice decorative feature in his downstairs loo. He is one of the “10 people who have most helped the poor in recent decades,” said the Tory blogger Tim Montgomerie in a Times piece, straplined ‘champion of the poor’. “Every little he did helped us,” said The Sun. “The outstanding businessman of the decade,” said the Mail. Do these people get out at all? They could visit one of the towns in Britain, such as Inverness, where three in every £4 is spent in a Tesco store; take a walk down the high streets reduced to a pathetic straggle of charity shops and tanning parlours. Then Leahy’s fans might begin to see why another part of the population – among them farmers, small business people and independent shop owners – don’t think Sir Terry helped at all.